Summer reading has such a bad reputation. For some people, books and beaches go together as well as pickles and chocolate cake. 1. LISTEN TO THE AUDIO BOOK VERSION. Yes! This is a thing! To any begrudging reader out there, I challenge you to try listening to an audio book. The experience of listening to a book is so different than that of reading a book, and it’s an experience that many students really find enjoyable. Audio books are a great option for any type of learner, but can be particularly helpful for students with ADD, as those students can multitask as they’re listening to the story. In fact, anyone can multitask while listening to an audio book, as long as the “other” task isn’t too intellectually stimulating. Many libraries offer free audio book downloads (right to your smartphone!) that can be checked out just like a traditional paper book. 2. ANNOTATE AS YOU READ. If you’re reading a book that you’re not particularly engaged in (aka … summer reading), then you’re likely to zone out while reading. This means you won’t retain any information and you will have to keep re-reading the same page, which means you’ll just wind up hating the book. But if you annotate while you read, you’re increasing your chances of actually retaining some of the information, which in turn will allow you to settle into the book (ie: not hate it). Your notes don’t have to be Shakespearean to be effective. In fact, I strongly recommend that you keep your notes and markings simple. The benefits of annotating text are countless: stay tuned for an upcoming post/video that goes deep into annotation. a) Read the same book as a friend, at the same time, but independently. Hold each other accountable to reading a certain amount of pages each day, and casually discuss what you read. Maybe you check in with each other after every 5 chapters, or maybe once or twice a week. Pick a schedule and stick to it. b) Summarize the story to someone else as you read. Let’s say you read 2 chapters a day – so every night you could recruit some lucky person (Mom? Dad?) to listen to you explain and summarize what you read. This conversation itself will help you process what you read and increases your chances of remembering what you read. I feel like I say this all the time, but one of the best ways to learn is to teach. c) Read the book with someone else. This isn’t for everyone, but some people find it advantageous to read a book to or with someone else. Perhaps this means you take turns reading aloud to each other. Perhaps it means you’re both reading at the same time in the same room as each other, and asking questions as they come up. This method is more of a group effort than method (a) is, but can really work for some types of learners. Book party, anyone? Now, if we lived in that fantasy world where I could sprinkle that magic I-love-reading-when-it’s-90-degrees fairy dust over students everywhere, then we would all be reading books that we absolutely loved. 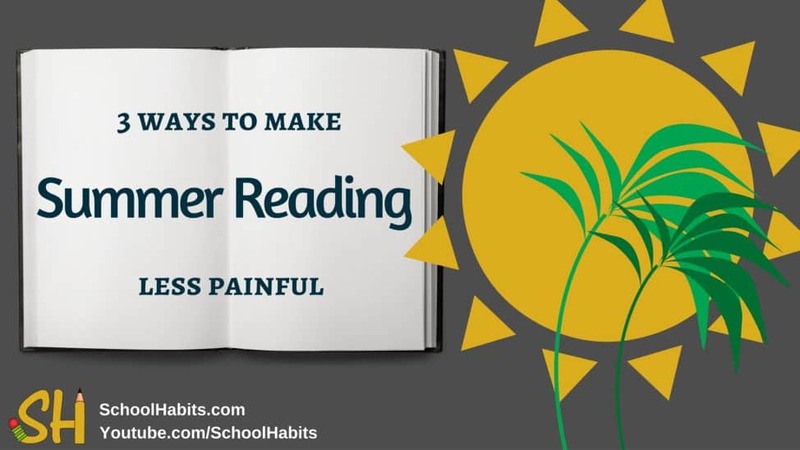 And then there’d be no need for 3 ways to make summer reading less painful. So consider yourself lucky if your required summer reading list includes books that actually excite you. For the rest of you stuck reading “The Genesis of 16th Century Bureaucratic Ineptitude” (jk, I totally made up that awful title), try what I suggest here. Don’t wait until the last week of summer to get started. Disclaimer: This article contains affiliate links from Amazon to products that I recommend. If you purchase any item from Amazon by clicking to its site through an affiliate link, the cost will be the same to you — but I will receive a small commission. Your purchase helps support SchoolHabits, and is much appreciated!